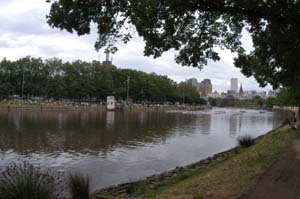 The race winds up the Yarra River from the heart of Melbourne to Hawthorn. See the Course Map on the Maps page. Officials will be at the City staging to assist in the timely dispatch of crews. Please also note that Boat Safety Officers will be present to ensure that boats comply with required safety standards. No on-water warm ups will be permitted. 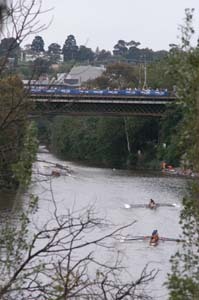 No crews are to go below Princes Bridge on their way to the start. Officials will remind crews of this requirement. Crews are to make their way directly to the start in an orderly manner when they get on the water. It is important for each crew to ensure they are on the “starting line” at the appointed “Start-time”. The Starter will start the race at the appointed time and crews not in line will penalize themselves. Officials will be available to assist in aligning crews. Crews will be lined up in predetermined rows of four boats abreast, however one crew at a time will be signalled to start. As the last boat in each row is sent off, the next row of boats should be slowly touching it forward into the assistant starter’s hands. There is a five-ten minute break between each Section. and a one-minute break in the middle of the larger Sections. There is a time penalty for crews who fail to start within five seconds of their race being called. See penalties for more information. If your boat or crew should become damaged or injured or for any reason and be unable to continue to row as a full crew you will be forced to stop racing and clear the course. You must pull over to the bank as soon as is practical and wait for the race to pass. Marshals will let you know when you are able to resume your row. If you require medical assistance refer to your coxswain’s medical card for guidelines. On-course Umpires are positioned all along the course and particularly at strategic points where there is a possibility of a collision. The Umpire’s role is to ensure that safety is paramount, fair play exists and to assist with the avoidance of collisions. Umpires are placed at ALL main river bends. Overtaking: A boat is deemed to be overtaking when it has its bow ball within half a length of the stern of the boat in front. When this occurs the slower boat must not block or obstruct the faster crew. The faster boat must be prudent and delay the act of passing if a pass cannot be accomplished without incident. This takes away zones and places the onus on the crews. The crew being overtaken cannot block or obstruct, but does not need to yield or slow down. It has the right to pursue its own race. However it does not get any protection from any kind of no-passing zone. The passing crew can pass if it is safe and should not be blocked or obstructed. Any crew that disregards an Umpire’s instruction will incur a time penalty (or disqualification). There is a real danger of an accident at the finish with fast finishing crews. It is therefore very important for all crews to continue rowing lightly once having crossed the finish line. Officials will direct crews at the finish, and time penalties will be enforced for not adhering to these instructions. The finish line will be buoyed and crews must follow the line of buoys to the turn before coming back to the Hawthorn staging. This is essential to allow for boats to be removed from the water in an orderly fashion. Boat storage Officials will direct crews to storage racks. All crew numbers including those worn by the cox and bow are to be returned to the bins placed at the foot of the ramps leading from the staging. All coxwains are to hold their boats when they are been moved by the end that is leading to ensure it does not hit someone. If your boat is stern first then you must hold the stern to ensure it does hit someone. Equally if it is bow first then you must hold the bow to ensure it does hit someone.